The sewing staff at Sew What? Inc. are always super excited to have a Dan Hadley design pass through the sewing room. Dan’s projects seem to bring out the best in our creative sewing skills, with textile minded challenges and fabric selections beyond the basic. It is always fun to watch the design come to life on the sewing table, and then see it in all it’s glory on stage once the tour starts. This design for the current Tenacious D tour was no exception! Tenacious D is a rock duo formed in 1994, by Jack Black and Kyle Glass. Over the years, Tenacious D has supported large bands such as Pearl Jam and Tool. This year the band released an album titled Post-Apocalypto and a web series called, Tenacious D in Post-Apocalypto, on YouTube. 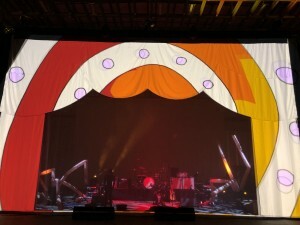 Tenacious D is currently on tour with our custom-made projection proscenium. This design focused on two elements, surface and shape. Firstly – a fabric surface that would precisely mimic a projection screen, without the cost and maintenance of a vinyl projection screen product; and secondly, a precisely shaped projection proscenium to showcase carefully mapped out graphics. When it comes to taking projection surfaces on the road, many of our touring clients lean toward a substitute material. 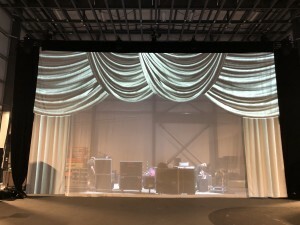 While a professional vinyl projection screen certainly offers a premium surface, there are many inherent difficulties in a touring “on the road” environment which include excessive weight, difficult to clean, problems unfurling and installing vinyl screens in cold weather and more. There are several substitute textiles that we find popular, and after reviewing the options designer Dan Hadley selected our 120 “Brillante”. With a jet black backside and a brilliant bright white semi-matte surface to take front projection it was the perfect selection. 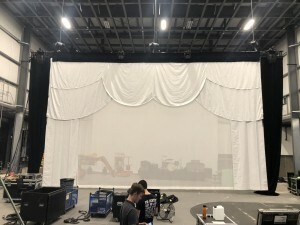 In order to keep all areas of the projection proscenium “seamless” the design was developed so that no individual surface area exceeded the 10 foot width of the cloth. The shape was printed as a paper pattern, so that there would be absolutely no error made with the curves being precisely per the design. 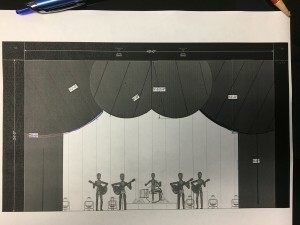 This is important so that the projection scene that had been pre-developed by the designer would sit perfectly on the cloth proscenium and not require to much graphic spill cleanup. The legs were sewn as separate pieces to the proscenium header, making the set three pieces for an easy install. All the items fit easily in the bottom of a hamper and had durable touring finishes applied to them such as heavy-duty webbing and grommets at the top and reinforced pipe pockets at the bottoms of the legs. It is amazing all the different looks that were created using the projection proscenium strategy. It is as though you are transported to a multitude of different venues in the course of one show. 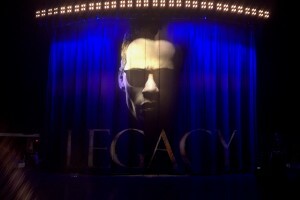 By projecting a variety of “drapery looks” the theme of the stage was instantly transformed. 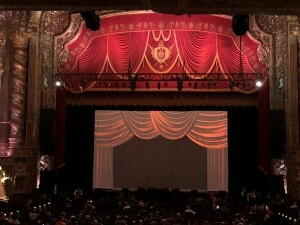 Themes were Gothic, Art Deco, Pop Art and more…… The custom proscenium most importantly provided a surface for colorful and bold artistic slides mesmerizing the audience with this unique use of projection in the foreground – rather than the more tradition use of images and projection “behind the artists”. 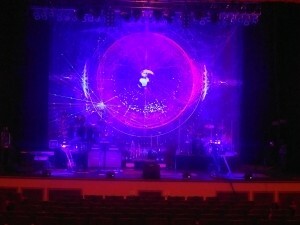 Check out these amazing images showing just a few of the projection scenes created for the show. And for those Tenacious D die-hards – here is a fun video on You Tube that you might get a kick out of – you will see our projection proscenium at work! Just like your audience, you want top performance. Sew What? understands and delivers. Our Stage Drapes and Theatrical Backdrops, Curtain Tracks and Theatrical Supplies exceed expectations and enhance your shows. For an experienced drapery manufacturer with work that ranges from digitally printed drapery for the hottest rock concerts, to the biggest theater performances, to just about any other kind of production under the sun, Sew What? is the answer. For inquiries call 310 639-6000. Next in our “Meet The SW?/RW? 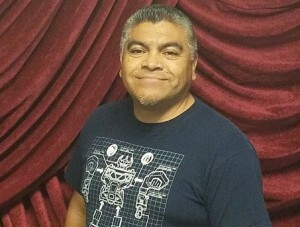 Staff” Blog Series, I want to introduce you to one of the most artistic and proficient employees here at the company—Danny Garcia, the hard-working and remarkable coordinator for our Printing Department. 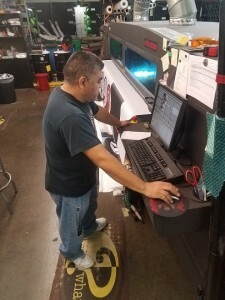 Often working long weekday hours and on nights and weekends, he goes above and beyond to get the printing job done right for our clients, and on-time. Not to mention how exceptionally helpful he is with all of our warehouse departments, and that he is just an all-around nice guy, too. We are so fortunate to have him on our team, and would love for you to take a minute to read a little bit more about this indispensable member of the Whatter’s Family. I was hired in October of 2015 as the printed operator, working with the graphics coordinator they currently had on staff. But by 2016, I was moved up to become the Printing Department Coordinator for SW. Basically, I organize and assist with client-provided graphics and artwork and file preparation, color correcting, and the actual digital printing of the soft goods. Then I work with the QC and Inspection Dept. to make sure that all of the printing outcomes are what the sales rep, and the client, had requested. If you could take a vacation to anywhere in the world, where would you go and why? I have a background working in one of the relics we don’t see much anymore—a photo lab (with actual dark rooms). However, I have been working as a printer operator/technician for over 17 years, and really seem to have found my wheelhouse! Just previously to working here at SW, I was a printer operator for a company in Glendale that did a great deal of marketing for the Hollywood industry—movies, TV Shows, up-and-coming bands, etc. We also did general types of digital printing, including banners, retail, signs for car lots, etc. With my history of working with photographers and photographs, I’ve found that I have a good eye for details— especially with Pantone color matching. It’s a great skill to have with this field in particular! 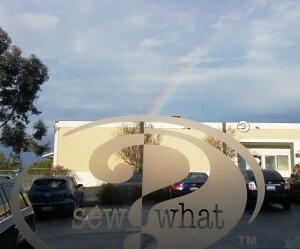 What is your favorite memory/circumstance/event from being part of the Sew What? family? I have really enjoyed all the ways that the company promotes social gatherings with one another, and the many special occasions that we like to celebrate together, too. Activities like having a Taco Truck and Ice Cream Truck come by to treat everyone with delicious food over the summer, and the yearly company car wash was also a really surprising and wonderful added bonus for the staff that I had never seen before working here. I am a self-proclaimed LA-based sports NUT—I really love watching Dodgers, Angels, Rams, Chargers, Ducks, Galaxy—you name it. If it’s an LA sports team playing, I’m probably watching! Am thrilled that there are so many incredibly teams right here in my hometown. I especially enjoy going to games in person whenever possible. I am a huge fan of all kinds of music—from Jazz to Rock to Country, and everything in between. There’s nothing better than sitting at home relaxing, listening to some great music on a lazy afternoon. Last year we worked on a complex series of digitally printed backdrops and multi-media drapes for Yusuf Islam’s tour that were totally different than anything I had previously worked on before. There were various different pieces of digitally printed drapes (printed on both Crystal Poplin and Heavy Knit), that were then intricately cut and sewn into elaborate shapes and structures based on the client’s provided graphics. By combining in blackout lining and Sharkstooth Scrim (to help provide for some extremely cool lighting effects), these mixed media pieces were some of the most elaborate custom drapery I have ever worked on. Sewing and printing had to be absolutely on point for this genuinely unique design. As a team, we were enormously proud of how truly fantastic they turned out. Anything more about your time here at SW? I really appreciate how “family-oriented” the team here at SW is….everyone is so much more than just an employee. We all care about each other’s welfare and morale, far beyond that of just being “co-workers”. It’s been such an eye-opening experience working for a company like this, and I absolutely love the family-vibe! The same is can be said for much of the “chaos” that often surrounds the planning of productions, trade shows, and concert tours—sometimes you simply must take the bad with the good. This is especially the case when it comes to the unpredictable “stormy” weather that can occur when it comes to planning live events (scheduling conflicts, changes of venue, cancellation/addition of performances, complete overhaul of stage design, etc.). You just need to trust that in the end your audience is going to love the show you produce, and that all of your hard work will be worth the extra care, labor, and effort that you and your team put forth. 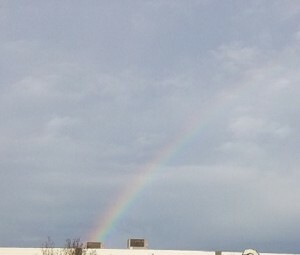 And that when it’s all said and done you will ultimately have an absolute “rainbow” of a great show! 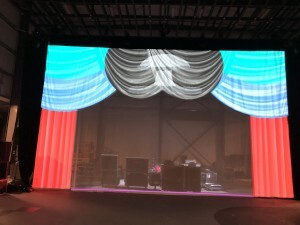 Let RW/SW help YOU create a “rainbow experience” for you and your audience, by helping take some of the stress out of your design process by providing you the highest quality, stunningly beautiful theatrical stage drapes and soft goods for your upcoming special events and concerts that you could ever imagine. Choose from our extensive variety of gorgeous rental stage curtains, or we can also build you custom drapes out of your own unique vision. Either way, give us a call so that we can help you “weather” the storms of designing your stage, so that everything will come out “rainbows” for your special event, too. Sew What? Inc. had the opportunity to really pull a rabbit out of a hat for the current Marc Anthony tour. Not only was the task at hand a challenge in terms of sewing – it was also a challenge based on the very limited time frame. This was our moment to shine by performing some super-high-speed-sewing! Nonstop printing and stitching were in order, and the SW team pulled out all the stops to create this 46’h x 75’w digitally printed brail lift drape in just one week. Wondering what a brail drape is? The term brail in fact comes from the maritime industry. Brails, in a sailing ship, are small lines used to haul in or up the edges (leeches) or corners of sails, before furling. On a ship rig, these brails are most often found on the mizzen sail. The command is, hale up the brails, or, brail up the sails. Certainly not to be confused with Braille, a tactile writing system for the blind. In this instance the lines are use to lift and unfurl the stage drapery to create a reveal and cover effect that can be operated remotely via the motorized lift system. For this project, there were a total of 16 vertical lift lines placed strategically on the back side of the drape. We craft these as near-invisible sewn vertical lines with O-rings running vertically to capture the aircraft cable that is used for lifting the drape. Each lift line runs the full 46 feet in height – so there were over 700 running feet of lift line alone on this giant drapery with nearly 500 hand applied o-rings on the back side. Matching the printed pattern is also a key component. In this case the print was printed onto 9 custom sized widths of fabric. For durability and a gorgeous lighting surface, we chose to direct print onto our crystal poplin. It is important that each printed segment is lined up perfectly before it is sewn. We used thousands of sewing pins to pre-pin by hand all the sections of cloth. So great attention is given to the craft of assembling the drape. Print. Seam. Add lift lines. Finish top, sides and bottom. Add hardware. Insert all the O-rings. Inspect. Fold and ship! It was a pleasure to work with the Marc Anthony team and specifically with his talented designer Travis Shirley and Roly Garbalosa of Garba Music. Sew What? Inc. was delighted to be a key player in the production of this amazing arena tour! Sew What? 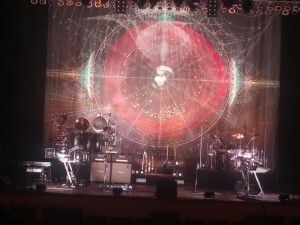 Inc. was recently given the opportunity to create a backdrop for TOTO. The artwork for this backdrop was initially delivered as a “square piece of art”. This is often typical for art that has been designed for an album or CD cover. In order to achieve a landscape style backdrop piece, it was necessary to have the artwork extended to add graphic elements to both the sides and the bottom of the scene. For this we worked directly with John Rios of John Rios Designs who is a skilled entertainment industry graphic artist and backdrop designer. In this case he used the style and theme of the client’s original artwork design and added details in the style of the original art so that it would fit the landscape shape we needed. The art was carefully formatted and saved so that the output would be at the greatest dpi resolution. The new art file was then zipped and delivered to us at Sew What? Inc where we printed the file on our wide format vutek printer in house. The piece was printed onto our heavy cotton canvas substrate, and there are many hours of printing involved in a backdrop of this size. Once printed onto 10-foot-wide panels of cloth, the drop was vertically seamed by our sewing staff. The graphic was carefully lined up so that the detailed pattern was beautifully and invisibly matched when sewn into its finished size of 30’h x 40’w. Webbing reinforcements, hems and pockets were added to make the backdrop installation ready. Once sewn the drape was then applied to a paint frame, where our skilled scenic artist took time to hand paint Ultra Violet effects carefully onto the key areas of the graphic. This is a slow process and requires great care. The painting must be constantly checked under black light to make sure the UV effects are producing the desired effect. More than just highlights, it was important that the drop had one look when under traditional stage lighting (to look and feel like the album art), and then take on its own complete UV look when the Ultra Violet lights are applied to it on stage (another worldly glow! Astronomical! ).